Purchased 2007 vintage from Sherbrooke Liquor in Edmonton. Poured a dark hazy brown with a huge tan head. Head was enlarged due to an amateur poor by myself – came in over two fingers. The beer was darker than I anticipated but is very appealing. Head retention was surprisingly short and virtually no lacing occurred. The aroma is incredibly complex. There are dark fruits immediately present with cherries most noticeable and plums and raisins in the background. It took numerous sniffs to identify but the other prominent aroma I can detect is brown sugar. The aroma has numerous other treasures to discover but my nose was not feeling up to the task on this day. 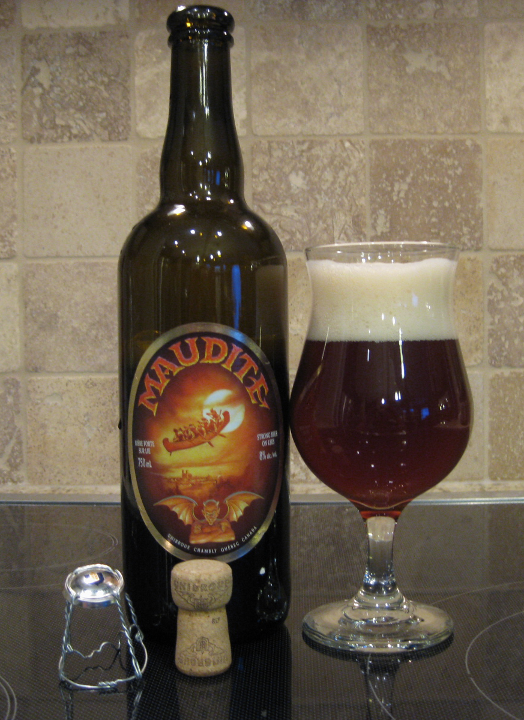 The taste mimics the aroma and includes a lot of dark fruit, some brown sugar, and a bit of a bready taste. I also taste roasted malts and some chocolate that were not foreshadowed by the aroma. 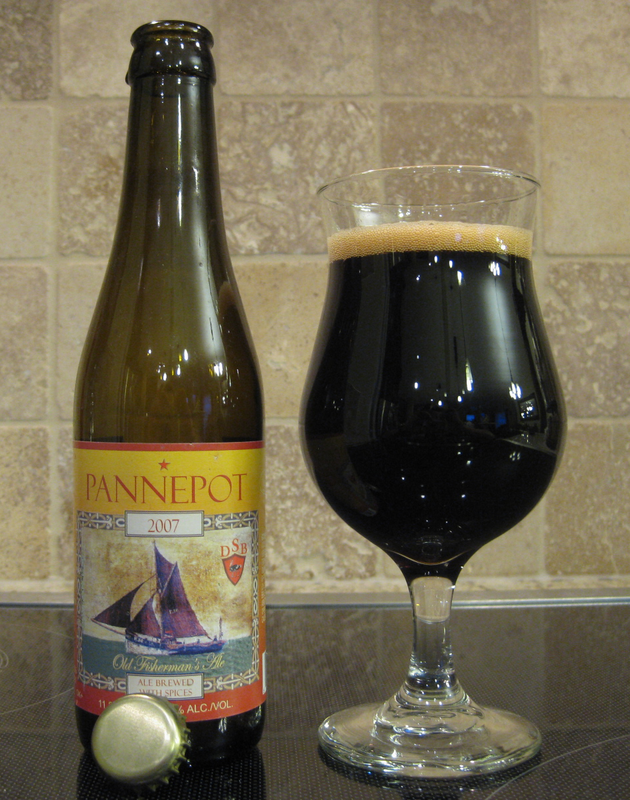 The finish almost has a faint coffee taste and betrays the presence of the 10% ABV. The mouthfeel is not incredibly smooth or harsh – occupying that middle ground. Carbonation is moderate as well. I have too many world-class beers lately. It is making me sound like I think every beer I try is the best I’ve ever had. Well not to go that far – but this beer is easily on the top 5 list. Ratebeer.com had it rated as the best beer available for purchase in Edmonton. It is pretty damn close to that. Purchased this beauty in a 750 ml bomber from Sherbrooke Liquor in Edmonton. Before I even give you the review I need to do a plug for this brewery. If you haven’t sampled the brews coming out of Unibroue – you need to do so as soon as you can. They are all quality. Check them out here. Pours a deep cloudy ruby color with a thick two-finger near white head. Head retention was very respectable with noticeable lacing. The nose for this brew is very sweet. I detect an earthy clove-like smell, some sweet fruitiness, some fairly potent yeast-funk, with a slightly bitter finish. This aroma is complex and inviting. The taste of the beer is strong and very rich, in other words, it is what you expect from the nose. Flavors are malty with evident citrus notes. Hints of berries or fruitiness come through with a dry partially bitter finish. The mouthfeel is more assertive than I was anticipating for the style. It goes down very smooth given the ABV and gives your tongue a nice tickle. The Belgian characteristics of this beer are up front and center and come through the bountiful aroma and flavor profile. None of this comes across as over the top though. Overall, this is an absolutely exceptional product. I am proud of Unibroue and the fact I can say this beer was brewed in Canada. The beer pours a cloudy honey color. The head development was rapid and fluffy. Head of about 1.5 inches developed and retention was very good – it seemed to last forever and displayed nice lacing. I have no idea how much pouring this into my new tulip glass affected any of this. I do love unfiltered and unpasteurized beers so I was excited by the appearance. The aroma was very subtle and I had difficulty actually picking out anything specific to comment on. This may also be a function of my somewhat congested nose but nothing demands your attention in the aroma. There is a faint sugary smell. The first taste imparted by the beer to me was an understated hint of banana mixed with much more prominent citrus notes. For spices the only one I could easily detect was coriander which strongly influences the taste of this beer. I would say this beer has medium carbonation – but not on the lighter side. It was very refreshing. As the you drink the beer the fruity citrus notes tend to give way to more of the spice. You taste surprisingly little alcohol in the beer despite that it is 8%. Be aware – this goes down so smooth you can land yourself in trouble if you have more than one on hand. In conclusion, I was impressed beyond my expectations with this beer and I would strongly recommend it to anyone – especially if you know you like wheat beer or any unfiltered or unpasteurized beers. Sidenote: this beer (or brewery) even has it’s own music! 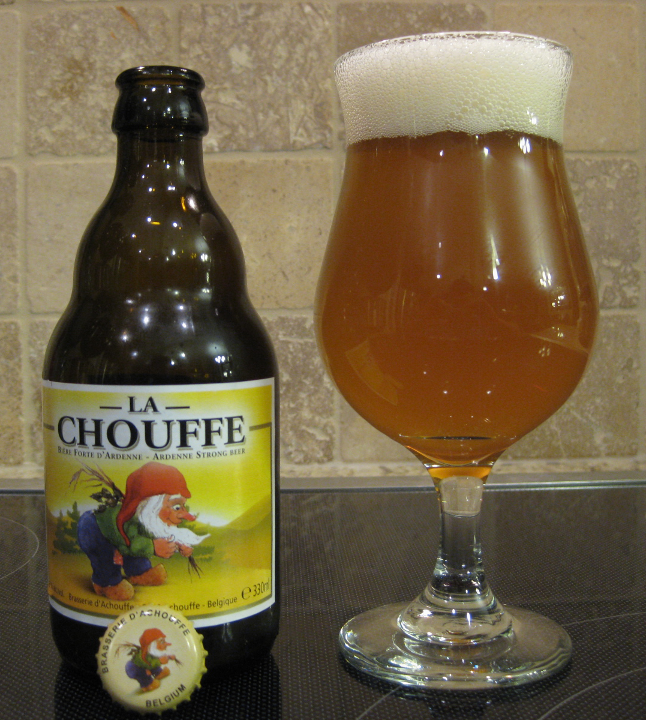 Listen to the Chouffe’s music.